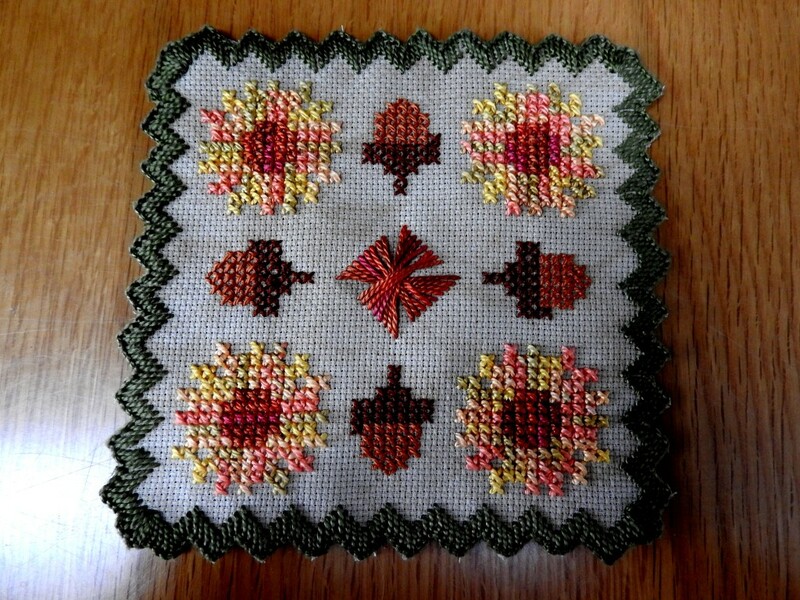 This 4.5 inch square doily was worked on 18 count Aida, color Country Mocha. Mums and acorns are my own designs that I came up with after web surfing and viewing numerous posted finished stitched pieces (I love viewing how other stitchers interpret flowers and such). This is offer as a free pattern on my webpage at free-patterns. 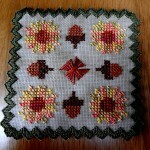 The border is worked in buttonhole stitch using a med dark olive color size 5 perle from my stash. The cross stitched mums were worked in DMC size 5 variations 4126 (Golden Sunset). Acorns were worked in DMC size 8 301(Mahogany Medium) and DMC size 8 300 (Mahogany Very Dark). The center of the mums and the centered Rhodes Stitch were worked in DMC size 5 variations 4130 (Chilean Sunset). This is the first time I have worked in DMC variations size 5 perle. A skein of DMC size 5 variations is 27 yards of overdyed thread. Description of this thread stated: Completely colorfast, and consistent color blend from skein to skein.